According to a new market report published by Transparency Market Research, the global video on demand market is projected to reach US$ 100,952.9 Mn by 2026. The market is expected to expand at a CAGR of 9.3% during the forecast period from 2018 to 2026. 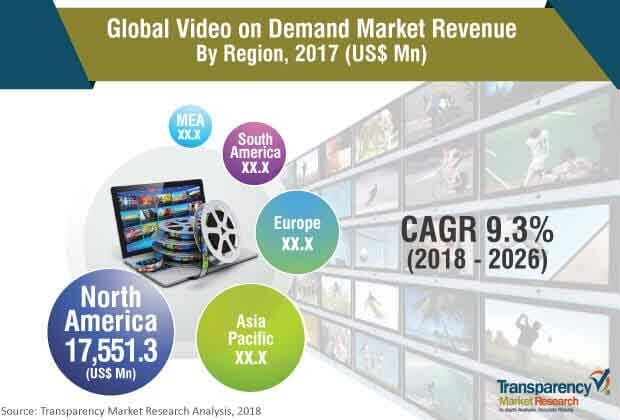 The global video on demand market is mainly driven by increasing consumer spending over the internet, and growing penetration of connected devices such as smartphones, smart TVs, and tablets for video consumption. North America is anticipated to lead the global video on demand market during the forecast period, followed by Asia Pacific, Europe, Middle East & Africa, and South America. Television programs are being communicated with the help of Internet Protocol Television (IPTV). IPTV sends movies and shows via internet connection. Without broadcasting a variety of shows, most IPTV use video on demand. Amazon Prime, Hulu, and Netflix video are popular examples of video on demand services. Several TV providers are now implementing a hybrid IPTV method to solve some of the problems with fully IP-enabled broadcasts. Hybrid IPTV merges IP-based TV services with traditional TV services and it is delivered via a single box. This enables TV providers to enhance their offerings to subscribers. Hence, Internet protocol Television (IPTV) is certainly getting better. The impact of this driver is high as IPTV is growing at a fast pace. The rise in user demand as well as developments in networks would support this growth. Many media providers are planning to provide new streaming services to compete with Amazon Prime, Netflix, and other streaming leaders. The global video on demand market has been segmented based on business model, content, and geography. Based on business model, the market can be segmented into transactional video on demand (TVoD), subscription video on demand (SVoD), advertisement video on demand (AVoD), and hybrid (SVoD + AVoD). Based on content, the market can be segmented into sports, entertainment, education and information, and TV commerce. North America led the global video on demand market, accounting for substantial share in 2017.The U.S is the major market for video on demand in the region. The increasing connected devices such as mobiles, tablets, and smart TVs are the major drivers for the video on demand market in the Asia Pacific region. The market in Europe, Middle East & Africa, and South America is expected to expand at a rapid pace during the forecast period.